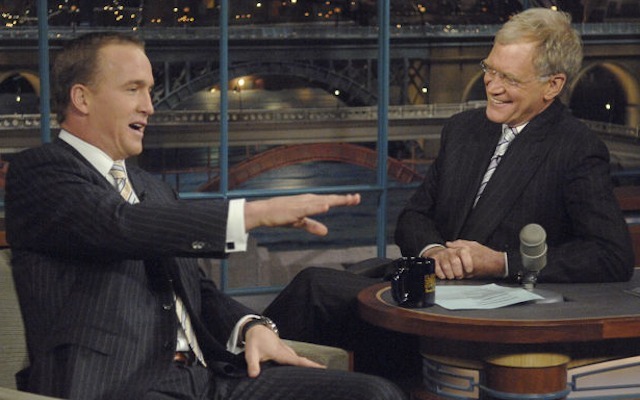 Broncos star QB Peyton Manning is two years removed from his 14 seasons with the Indianapolis Colts, but talk-show host David Letterman remains a die-hard Manning fan even though the quarterback has left Letterman’s hometown. After a year off the gridiron because of a potential career-ending neck injury, the Colts released Manning in 2012. Indianapolis’ loss was Denver’s gain. On Monday, Manning made his fourth appearance on the “Late Show With David Letterman” where he talked about his 3-year-old twins (a boy and girl), the ESPN special on the football-famed Manning family, the “Omaha” signal at the line of scrimmage and the career-threatening injury. Here are some snippets of the conversation, according to a transcript synopsis at www.cbs.com/shows/late_show/wahoo_gazette/. Dave raves about the ESPN special on the Manning family. (Peyton’s) dad Archie was an All-American and a legendary college and pro football player. The Manning boys, Cooper, Peyton, and Eli and were just normal rambunctious kids. The special included a lot of home movies. Peyton says he wishes there was a bit less footage of Peyton crying. Manning admitted there are some throws he can longer do, but has developed other parts of his game. He likens himself to an aging, crafty baseball pitcher who can no longer throw the fastball past the hitter so has to learn other ways to get the batter out. “What’s with the ‘Omaha Omaha! ?” Letterman asks. Fans can hear Peyton bark out ‘Omaha’ when at the line of scrimmage. It is his way of signaling a new play at the line. Letterman and Manning finished their segments on Broadway to participate in the Late Show Quarterback Challenge (Monday night’s challenge: throw a football through an open window of a passing yellow taxi. Peyton completes two out of three, just like his NFL average. Dave was 0-for-3. CBS “This Morning” correspondent Mo Rocca goes head to head with John Blackstone over which city is cooler: Seattle or Denver. Blackstone opines on Seattle’s origin of Starbuck’s (who cares?) and fresh fish from Pike Street Market, but Rocca one ups him with our lack of need for umbrellas due to our 300 days of dry weather and sun. I lived in the Seattle-area twice and I remember breaking down in tears in June because it was pouring rain and way cold and I was wearing a raincoat. Just gross! Rocca even goes so far as to try Rocky Mountain oysters at The Buckhorn Exchange, which many visitors shun. Right now, everyone whether on local or national TV is jumping on the bandwagon, but it’s beyond fun to see our Mile High City getting so much positive publicity! You know that our Visit Denver folks are salivating! 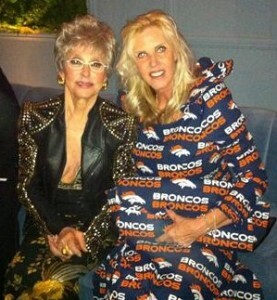 See the whole bit at http://www.cbsnews.com/videos/seattle-vs-denver-which-super-bowl-city-is-best/. Freaking hilarious! With the Super Bowl nearly here, so much of the focus has been on Peyton Manning versus Russell Wilson and Demaryius Thomas versus Richard Sherman, but the real attention should be on Mike’s Stadium Sportscards in Aurora versus DJ’s Sportscards in Renton, Wash. Instead of a traditional bet, charity will be the winner. Should the Seahawks win, Fruitman will be making a $250 donation to The Shepherd’s Crook Ministries, which partners with adoption agencies to match special needs children with families who are able to adopt him. http://theshepherdscrook.org/about/purpose/. If the Broncos win, Joss will be making a $250 donation to the Share Basket Project. The Share Basket Project is organized by Barbara Fruitman who can be reached at 303-699-9808 or BarbaraFruitman@yahoo.com. 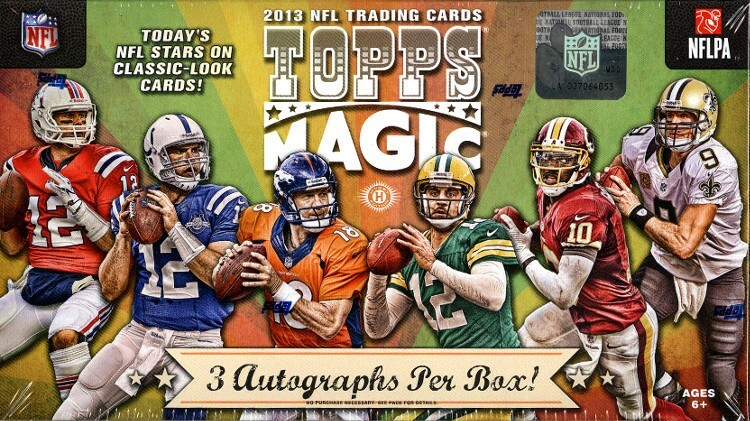 In addition, the winning card store also will be sharing an entire 12-box case of 2013 Topps Magic NFL with collectors. Each box of Topps Magic yields three autographs on average and with some luck, you could pull autographs of players like Denver Broncos rookie Montee Ball, Seattle Seahawks veteran Marshawn Lynch, Bo Jackson, Barry Sanders, Andrew Luck, Drew Brees and more superstars. 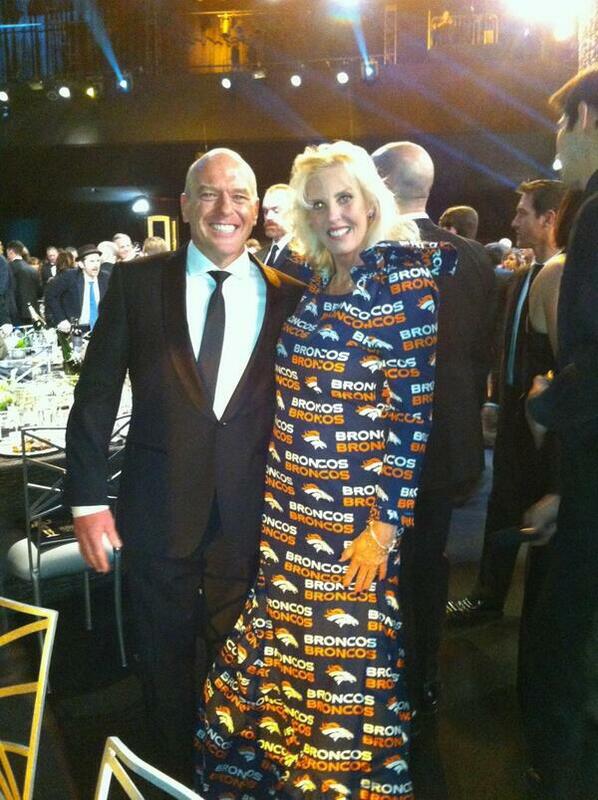 Beleaguered Toronto Mayor Rob Ford showed off his Super Bowl favorite by wearing the No. 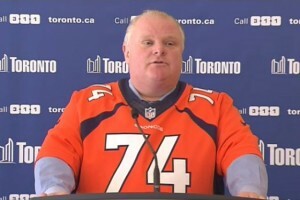 74 Denver Broncos jersey during a press conference on Monday. Ford, whose term as mayor has been riddled with scandals of drinking and crack-smoking, wore the jersey in support of Broncos offensive tackle Orlando Franklin, who lived in Toronto until his high school days. Franklin and his family moved to Florida when he drew interest as a football player. 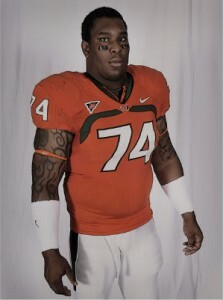 Franklin attended the University of Miami before being drafted by the Denver Broncos. As the Seattle Seahawks and the Denver Broncos prepare to face off in Super Bowl XLVIII on Sunday, community foundations in their home cities are calling on their communities to face off in a contest of charitable giving, called First and Give. In Denver, the message is to be United in Orange to Fight Childhood Hunger, raising money to help feed hungry kids through the Food Bank of the Rockies, a flagship community partner of the Denver Broncos. Both The Denver Foundation and Food Bank of the Rockies are waiving all administrative charges so that every dollar raised will go directly to buy food for children in need. In Seattle, they’re flexing their charitable muscles through the 12thManGives, raising money for Make-A-Wish Alaska and Washington, which grants wishes of children diagnosed with life-threatening medical conditions. The team will be sending kids to the Super Bowl through Make-A-Wish. The great thing about First and Give is that everyone wins – the contributors, the youth, and the communities. Beginning today, the foundations will be competing to see which organization can raise the most money and garner the highest number of individual donors through 10:59 p.m. MST on Super Bowl Sunday, Feb. 2. With two measures of success, the “competition” could easily result in two winners! The Seattle Foundation’s president, former Seattle Mayor Norman B. Rice, was born and raised in Denver but has been a Seahawks fan since the team launched in 1976 and is a Seahawks season ticket holder. 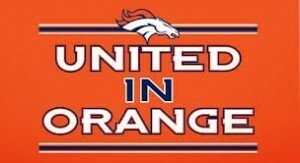 To give go to www.denverfoundation.org, click on “donate now” and designate to United in Orange to Fight Childhood Hunger. The Denver Foundation will forward all proceeds directly to Food Bank of the Rockies to help feed hungry children in Metro Denver. All gifts to the fund are tax-deductible to the fullest extent of the law, and will be distributed quickly to help fight childhood hunger in our community. 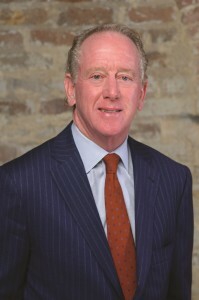 Jewish Family Service of Colorado welcomes Archie Manning, football star and legend in life, as the speaker for its 10th annual JFS Executive Luncheon fundraiser on April 30. The luncheon will be held at the Grand Hyatt Denver, 1750 Welton Street. Doors open at 11:30 a.m., and the program will start at noon. Tickets are $150 and sponsorship packages start at $1,500. For more information or for tickets, contact Dawn Richard at 720-248-4605 or go to www.jewishfamilyservice.org/luncheon. All proceeds from the event will help support programs of JFS, including mental health counseling, senior and adult in-home care, disability and employment services, and family safety net services. Founded in Denver in 1872, JFS is a nonprofit community agency serving people regardless of age, race, faith, or income. When people think of Archie Manning, football immediately comes to mind. But Manning has inspired many with his warm personality, humor, drive, and commitment to family and community. Manning and his wife, Olivia, have three sons, Cooper, Peyton and Eli. Archie and Olivia raised their sons with the philosophy that, “It’s the right thing to do, so do the right thing.” The result, which Archie and Denver Broncos’ quarterback Peyton capture so clearly, is a tribute to the values that Americans hold dear: work hard, stand up for what you believe in, treat each person with respect, and be grateful for what you have and for what you have achieved. A former Pro Bowl quarterback and NFL MVP, Manning enjoyed a fabled football career, beginning at the University of Mississippi where he was named an All-American and is the only Ole Miss player to have his number retired. He was elected to the 50-Year All-South Team (1940-90), named one of the Top 25 Athletes of the Century in Louisiana, and he and his son, Peyton, were named among the 100 all-time greatest college football players. In 1971, Manning was the second player chosen in the NFL draft and the No. 1 draft choice of the New Orleans Saints. He set Saints’ passing records, played in two Pro Bowls and was named the NFL Most Valuable Player in 1978. His prowess on the field and his sterling character have earned him as many awards as he scored touchdowns. Archie Manning concluded his 15-year NFL career in 1985. Manning since has devoted his life to his family and to causes that he believes in, supporting the Special Olympics, Boy Scouts of America, The Salvation Army, and the United Way, among others. 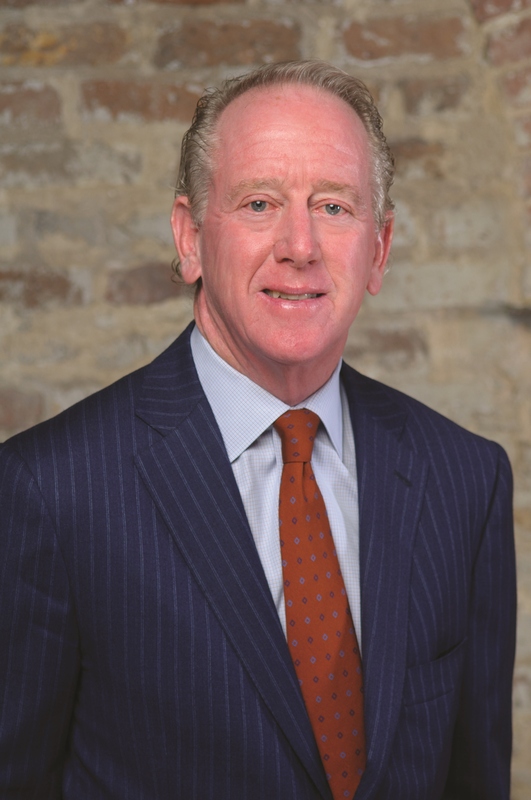 Archie Manning will be the keynote speaker at the 10th annual Jewish Family Service of Colorado Executive Luncheon fundraiser on April 30. “Their geographic locations could not be more different. Denver is located 5,280 feet above sea level on high rolling plains at the base of the Colorado Rocky Mountains. Seattle is located in one of the most spectacular natural harbors of the world. But despite these physical differences, Denver and Seattle actually share much in common. Not on the list is the fact that I have lived in both cities – twice! And that Colorado and Washington both voted to approve recreational marijuana sales. “Denver – founded in 1858 as a gold-mining camp. “Seattle – founded in 1851 as a logging and fishing center. “Denver – 2012 population of 634,264 making it the 23rd largest city in the U.S.
“Seattle – 2012 population of 634,535 making it the 22nd largest city in the U.S.
“When bypassed by the transcontinental railroad, Denver built its own connecting railroad in 1869. “When bypassed by the transcontinental railroad, Seattle forced its own connecting railroad in 1883. “Denver was rescued from a deep depression by the discovery of gold nearby in Cripple Creek in 1890. “Seattle was rescued from a deep depression by the discovery of gold nearby along the Klondike River in Canada in 1897. “Denver has a history of boom and bust economies and is currently booming with eight new downtown skyscrapers, 1,500 hotel rooms and a rail line from downtown to Denver International Airport all under construction. “Seattle has a history of boom and bust economies and is currently booming with aerospace, computer software, biotech, e-commerce and international trade. “From the late 19th to mid 20th century, Denver was known as The Queen City of the Plains. “From the late 19th to mid 20th century, Seattle was known as The Queen City. “Denver has a national reputation for beer, including Coors, Great Divide, Breckenridge and Wynkoop breweries. “Seattle has a national reputation for beer, including Red Hook, Pike and Pyramid. “The cartoon South Park takes place near Denver and frequently features Denver landmarks. “The comic strip Doonesbury takes place in Seattle and frequently features Seattle landmarks. “Denver is home to the first Chipotle and the first Quiznos, both of which started here. “Seattle is home to the first Starbucks, Nordstrom, Boeing and Amazon.com, which started there. 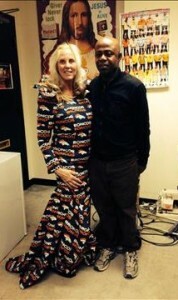 “Actors from Denver: Amy Adams, Don Cheadle, Keri Russell, AnnaSophia Robb, Matt Stone, Trey Parker. But come Super Bowl Sunday, these towns will have nothing in common except the desire to win!